While our trip to Cockatoo Island a year ago seems like it was an age away, this year feels like it has sped by. We’ve already launched two major projects in 2016 – something I don’t think we’ve ever done before. No wonder it feels like we’ve been busy. We had our final quarterly planning session for 2016 earlier this week. These last-quarter planning sessions feel different. You’ve already spent the year refining the plan so you just feel like you want to get on and do it. Save the big picture stuff for the new year. At least that’s how our session started out. We spent a good deal of time reflecting on the last quarter. We were a month ahead of schedule at the start of last quarter. By the end of the quarter we were a month behind. Why did this happen? And why did we feel on the edge of burnout, and what structural changes can we make to ensure that doesn’t happen? We didn’t come up with any big solutions but it’s good to be talking frankly about it and starting to plant the seeds of positive change. One small thing we have planned this quarter is to spend a bit of time discussing how we can improve the Foundation’s financial sustainability. This is something we need to address in the year ahead. 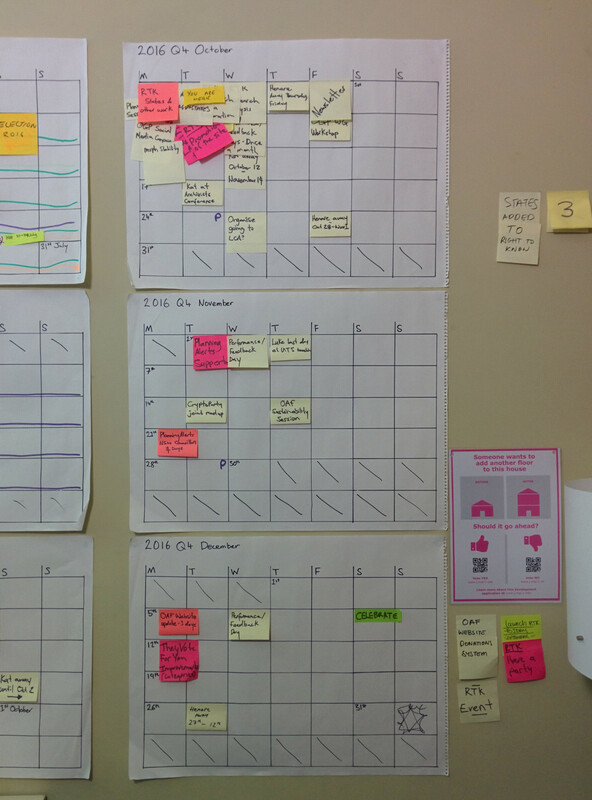 In August Luke spent a day exploring and hacking on a prototype that gives us feedback about the use and impact of PlanningAlerts. He was happy with what he created but left feeling like he had even more questions and a better sense of what those questions should be. We’ve also seen evidence recently of something we’ve long suspected – that when we don’t work on a project its use and impact can actually drop off. This shows us that it makes sense for us to try having these days regularly. All this quarter we’ve got a day set aside each month to work on understanding the performance of a project. We’ll focus on a different project on each of the days. Despite having spent more time on Right To Know than originally planned we’re going to keep working on it all through October. We’re really enjoying working on it and it seems to be having a big impact. We’ve already gathered all sorts of data on how requests are working at the state and local government level. The next step is to analyse the data and learn what things we can do and what changes we can make to improve that process. We’re finally going to do something with the late Civic Tech Monthly newsletter. Our first ever project performance feedback day will be next week. We really should come up with a snappier name :) It will be dedicated to Right To Know. Matthew is coming back from holidays and will continue work on morph.io stability. Hopefully we’re only a few weeks off having a much more stable and happy morph.io. PlanningAlerts Supporters has been rescheduled to start in November. We learned a bit in our EOFY donation drive that will be useful in this work. We also need to spend a few days working on Ask Your Councillors so we can add in the recently elected NSW councillors. Our performance feedback day will be on PlanningAlerts. We have a joint meetup with Sydney CryptoParty in the works and we’ll have our first OAF sustainability session. We’re really disappointed and frustrated with the usability and appearance of our website and donations systems. They’re not the good examples we want them to be (special shoutout to those reading this on a mobile device!). In December we want to see how far we can get in just 3 days reworking the website so it at least works on mobile and generally looks and functions a bit better. We’ll also start a couple of weeks work on some They Vote For You improvements. We’ll dedicate our performance feedback day to TVFY which will also help feed into this. And finally, in December we’ll once again have a little celebration with you – the people that have made 2016 possible. Thank you all. This entry was posted in Planning and tagged Ask Your Councillors, celebration, Civic Tech Monthly, CryptoParty, donations, mobile, morph.io, performance, planningalerts, PlanningAlerts Supporters, research, Right To Know, They Vote For You. Bookmark the permalink. Post a comment or leave a trackback: Trackback URL.